Cliff Dwellers Club, 200 South Michigan Ave.
Camagüey, Cuba, located 300 miles east of Havana, was founded in 1514 as Santa Maria del Puerto del Principe. The city was isolated from the island’s centers of finance and power until the arrival of the railroads in the mid-nineteenth century, and as a result, developed a distinctive culture still evident today. Camagüey is especially noted for its architecture, with unique examples of such diverse styles as neo-Gothic, neo-Colonial, eclectic, Art Deco, and even some early Modernism lining its streets. 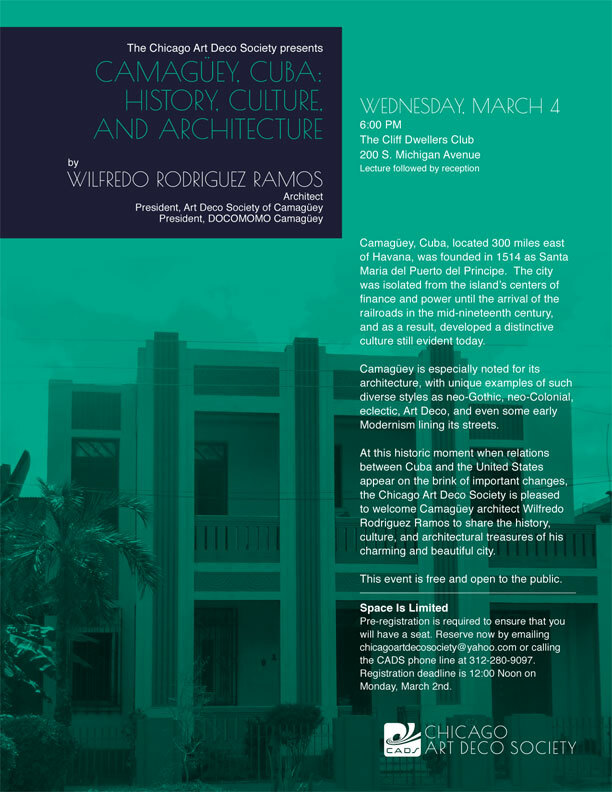 At this historic moment when relations between Cuba and the United States appear on the brink of important changes, the Chicago Art Deco Society is pleased to welcome Camagüey architect Wilfredo Rodriguez Ramos to share the history, culture, and architectural treasures of his charming and beautiful city. Pre-registration is required to ensure that you will have a seat. Registration deadline is 12:00 Noon on Monday, March 2nd.